In a medium bowl, mix together 2 cups of flour with the baking soda and baking powder. In a separate medium bowl, mix together 1 ½ cups of flour with the ginger, cloves, cinnamon, both sugars, and allspice. Layer the two mixtures (starting with the flour-baking soda + powder mixture) into a 32 ounce mason jar. Pack ingredients tightly and seal. And there you have it. 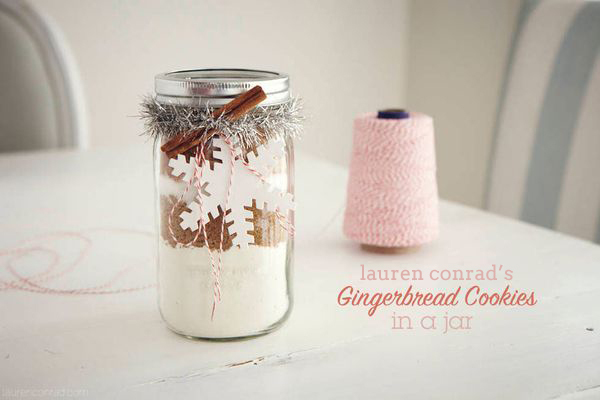 If you have a fun “in a jar” gift idea, share it in the comments below. Be sure to check out our Holiday Gift Guides for more ideas too!